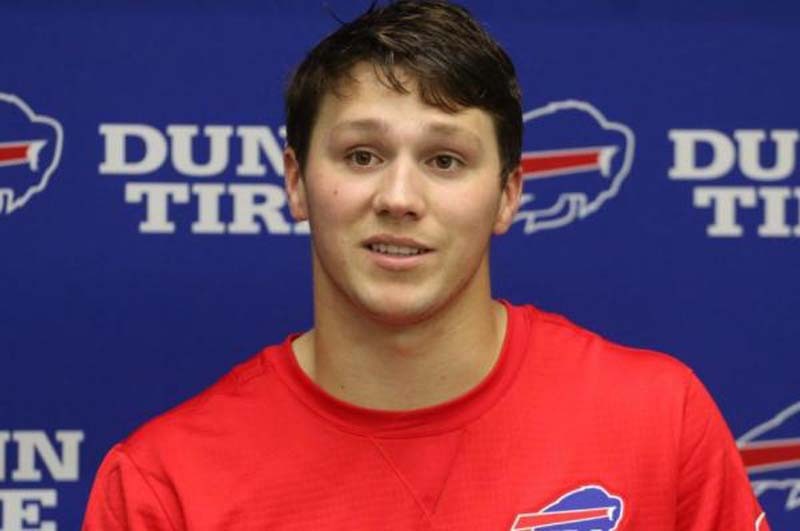 Buffalo Bills rookie quarterback Josh Allen continued to work with the third string Thursday on the final day of organized team activities. Allen, who was taken with the No. 7 overall pick by Buffalo in the 2018 NFL Draft, currently is behind AJ McCarron and Nathan Peterman on the depth chart, although offensive coordinator Brian Daboll said to not put much stock into that. "Again, it's OTAs, so it's more of a rep chart, not a depth chart. You're trying to get as much work as you can with all the different groups, whether it's a guard going to tackle, a center going to a guard, or a receiver going from 'Z' to 'X,'" said Daboll, per the team's official website. "You're trying to provide as much flexibility within the system. You only get 53, 46 [players] that goes into a game, so the more guys [that can] know multiple things, that's critical at every position." Allen did get a chance to make an impression at the end of Thursday's session while running the two-minute drill with the third-team offense. On his first drive, he was intercepted on his third attempt but capitalized when given a second opportunity. Starting at his own 30-yard line, Allen sandwiched a pair of 10-yard completions around a 20-yarder. The 6-foot-5, 237-pounder out of Wyoming found Robert Foster for a 13-yard connection to the seven-yard line with 14 seconds left. He capped the march by finding Cam Phillips in the end zone with five seconds remaining. "It's always good to bounce back," said Allen. "I saw what I saw and the corner came out and made a good play. I was able to get another drive and go out there with the younger guys and was able to put together a drive and score. "We're out here just trying to get better. Thankfully I'll learn from that mistake and use it going forward." McCarron, signed as a free agent in March after being a backup with the Cincinnati Bengals, is the front-runner for the starting job. He has played in 11 NFL games and has not started a game since 2015. Allen, who threw for 1,966 yards with 19 touchdowns last season, has been criticized for his lack of accuracy but Daboll had plenty of positives to say about the rookie. "Josh Allen is a mature kid and he's handled his responsibilities well," said Daboll. "He comes in each day looking to improve and correct his mistakes."